13 pages including introduction page. After a very prolific decade of highly praised work in the field of photography, Jaime Zobel has felt the urge to further explore a new dimension in his artwork. He has achieved this by way of his now well-known photo collages , a form claimed by surrealists and graphic designers. In retrospect, the move was a natural challenge for him in this era of digital imagery and multi-disciplines. 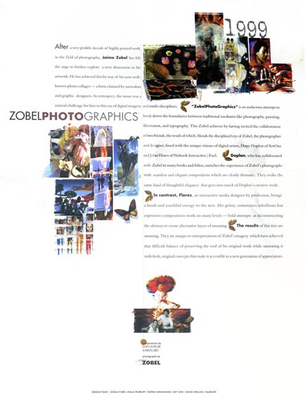 ZobelPhotoGraphics is an audacious attempt to break down the boundaries between traditional mediums like photography,painting, illustration and typography. This Zobel achieves by having invited the collaboration of two friends,the result of which, blends the disciplined eye of Zobel, the photographer and designer, fused with the unique visions of digital artists, Dopy Doplon of ArtOne and John Flores of Nubook Interactive/Fuel. Doplon, who has collaborated with Zobel in many books and folios, enriches the experienc of Zobel's photographs with seamless and elegant compositions which are clearly thematic. They evoke the same kind of thoughtful elegance that goes into much of Doplon's creative work. In contrast, Flores, an interactive media designer by profession, brings a brash and youthful energy to the mix. His gritty, sometimes rebellious but expressive compositions work on many levels, bold attempts at deconstructing the obvious to create alternative layers of meaning. The results of this trio are stunning. They are unique re-interpretations of Zobel's imagery which have achieved that difficult balance of preserving the soul of his original work while saturating it with fresh, original concepts that make it accessible to a new generation of appreciators.